If there is any Linux performance issue we mostly go to Google and find commands to analyze the performance but multiple time it's difficult to find it when we required some specific details so, we have tried here to place all the Linux performance utility which can help you to analyze the Linux server performance. There are multiple utilities available to analyse Linux server. Which includes CPUs, Memory, I/O, disk, network analysis. free Displays free and used memory. iostat Displays disk I/O statistics. netstat Reports on network statistics. vmstat Monitors processes, CPU, memory, or disk I/O bottlenecks. top Identifies sessions consuming the most resources. watch Periodically runs another command. df Reports on free disk space. 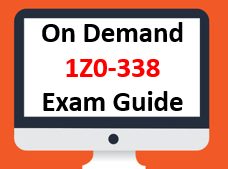 Generally Organization keeps different database for Reporting and Application Transaction because of the performance issues so whenever any transactions happen to the Application Transaction database it will immediately replicate to report database which help to get up date data while fetching report from the reporting database. Business don't want to access same database for reporting and transaction because of the performance impact on single DB as mixed workload can slow the database and that's why they prefer to keep separate database for both activity which gives overhead of h/w & s/w management, required more resources to handle both environment and ultimately it will increase TCO at the end of day. 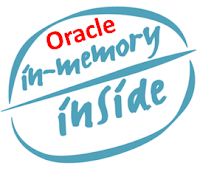 To overcome from this situation Oracle comes with DBIM (Database In Memory) which keeps frequently accessed data in memory to get faster response and decrease the response time by eliminating disk IO. It will store Database in storage only but it will store most accessible data in memory which gives faster response compare to read from disk. We can also influence object which we want to keep in memory. 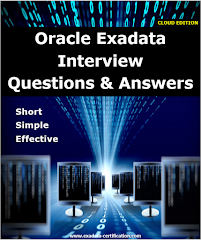 All the DBA don't get chance to work on Exadata as only DMA would have access to the Exadata so , if you are a DBA and want to know that whether your database is running on Exadata or not than you can check with below query. If this query gives the output >0 than database is running on Exadata. It means database is running on 1/8th Exadata as 3 tells you the number of cells available on database machine. By executing "select distinct cell_name from gv$cell_state" you will get cell IP details. How to change password of CISCO switch on Exadata ? Minimum_days (M): The minimum number of days required between password changes i.e. the number of days left before the user is allowed to change his/her password. Maximum_days(m): The maximum number of days the password is valid (after that user is forced to change his/her password). Warn (W) : The number of days before password is to expire that user is warned that his/her password must be changed. 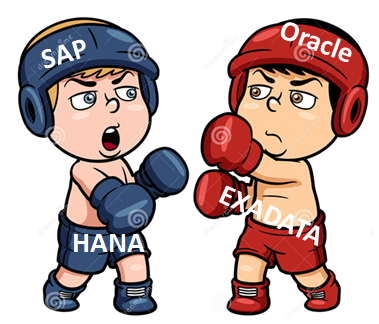 We have provided some major difference between SAP HANA and Oracle Exadata. Even Exadata is not comparable with HANA than also we have tried to conclude it based on materials and documentation available in the market. SAP HANA is an in-Memory Appliance. SAP HANA is an in-Memory Appliance. Oracle Exadata is based on Oracle servers, storage, networking, and software– all engineered and optimized to work together. It’s meant for Mixed workloads, i.e OLTP,DW SAP HANA and partner solutions powered by the SAP HANA in-memory software. 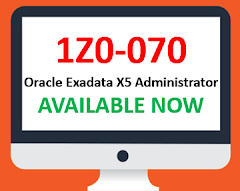 Oracle Exadata is delivered pre-configured, pre-tested and pre-optimized, with all necessary software, storage, hardware,and interconnect to lower total cost of ownership and provide quick time to value. Oracle Exadata is sold, delivered, and supported as a single-vendor solution with quick time-to-resolution. SAP HANA relies on third-party compute, network,and storage vendors. Multiple points of support lead to longer downtimes and higher total cost of ownership. 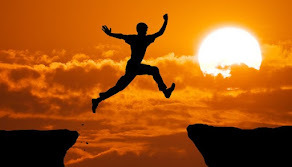 No single vendor is accountable for the solution's service-level agreements and due to its complexity, HANA deployments typically require a significant amount of effort.